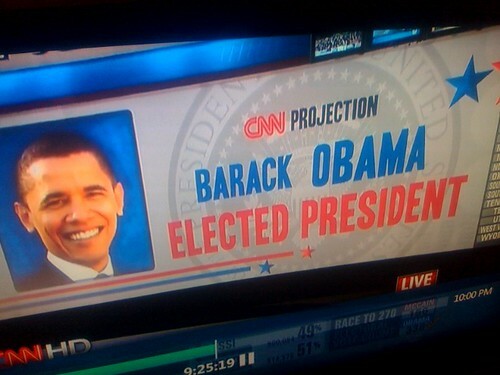 I don't think there's much to be said about the presidential election that hasn't been said already. Sean and I started the day on tenterhooks, hearts hammering and---hell, what am I saying, we started the year on tenterhooks. We watched CNN pretty much every night of the week in 2008, tuned in obsessively to all of the debates, followed every blip and blurb on Barack Obama, crossed our fingers tight, tight, tight. So November's shaping up to be a pretty exciting month, I think. For a start, a TJ Maxx just opened in downtown San Francisco---a first! We have a Marshalls, yes, but you'll get your stuff stolen there---and I've been looking forward to this moment for two months, ever since Moose and I passed a sign on the freeway that said TJ MAXX COMING SOON. The funniest thing about the day is that it starts out badly. Having finally mastered the stovetop espresso pot in our tiny kitchen, I pour inky liquid into two tiny cups and hold them up proudly for Sean. On my first sip, I realize I've mistaken the salt for the sugar. There are two ways to realize that you've mistaken the salt for the sugar and this way is the worst one. As I'm spitting the briny mouthful back into the sink, the toast pops up, black and smoldering. Just like that, our first breakfast in Rome is ruined. Do you know what one of the most lovely feelings in the world is? Well, wow, that was fun, wasn't it? Thank you so much to everyone who entered my competition; I can't tell you how interesting it was to read through all those middle names. I'm slightly obsessed with names, you see---I have been for as long as I can remember; I actually got a baby-naming book for my seventh birthday---and having 655 people present me with their middle names, one after the other like that, was as exciting as Christmas morning! Seriously Good Update: Now Win Guitar Hero Too! Holy shitballs, there are a lot of entries for my Nintendo DS Lite competition already. Apologies to my mother, father, Sean's mother and father, various assorted aunts and family members, and anyone else who might have been offended by me starting a post with holy shitballs, but whoa. You people are some fierce competitors. And now! Stop the presses! THE STAKES HAVE BEEN UPPED! So, like, a hundred million years ago, I entered a contest held by Slynnro. And the most amazing thing happened: I won!